When the men entered the sanctuary together, walking side by side—a Christian and a Muslim—parishioners stood to their feet with rousing applause. The spirited March 25 service was part of special monthlong events honoring Pastor Barrett, his wife, Cleopatra, and their family for their sacrifice and continuous work to uplift the Black community in Chicago through their dedicated hands-on ministry and outreach. Working with Black people and fighting to stay on the straight path to God once one has declared themselves a disciple or believer, regardless of their professed religion or spiritual path is not easy, Min. Farrakhan explained. Often family, friends, loved-ones and those who follow a man or woman who have dedicated their lives to God, suffer right along with that person, added Min. Farrakhan. Or, he continued, once trials and tribulations hit, people that once supported that faithful one begin to abandon and speak evil of him or her. But the path is not without problems and trials, Min. Farrakhan explained to the audience. He asked them to think back to when they first made a commitment and first professed belief. “The spirit and the zeal when you first find Him (God) and when He first finds you as one of His own that’s a joyous time. ‘Take me back’ … why do you want to go back? Because when you are a true servant of God and His Christ, the journey’s not easy,” said Min. Farrakhan. The moment you profess you have found God is when the trials begin, he pointed out. Members of the audience, the majority of whom were Christian, clapped and nodded their heads in agreement as Min. Farrakhan addressed salient points throughout his message. “You would think that after you find the Lord it would get easier as pastor. This has not been an easy journey for my brother—(and) certainly not an easy journey for me; because when you find the Lord, He wants you to say yes; because you’ve been saying no all your life so when you found Him first you said yes. But then the trials begin. Satan enters the picture. Nobody who knows Christ is unacquainted with the wiles of Satan,” the Minister continued. The job of Satan is to turn the faithful from saying “yes” to start saying “I wonder,” particularly when the love people first encounter in a house of worship, begins to disappear. “Sometimes when you’re ‘buked and scorned, sometimes when you feel rejected, sometimes when you’re evil-spoken of, sometimes when the good that you’ve tried to do, Satan tries to make it evil and then people turn, that once said yes. Then it became, ‘well I don’t know. They said such and such and so-in-so about my pastor and I’m not sure.’ And then doubt comes in and starts corrupting faith,” said Min. Farrakhan. Belief is the absence of knowledge, but God wants you to know Him, explained Min. Farrakhan. “Know that He is with you; know that He is present in your life, know that He got your back and your front and your side … know this,” he emphasized. 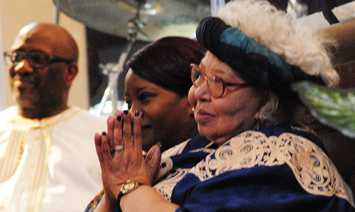 He thanked God for Pastor Barrett’s steadfastness, faith and endurance over the past 50 years. Pastor Barrett and his family have suffered personal loss over the years including the 2007 murder of daughter Kleo, 27, in a case of domestic violence. “This is a good man and I’m honored beyond words to be here with you this morning and to say how much I love you, and respect you, and honor you, and love your wife and your children because whatever you both have been through, the family goes through; and as I came up and saw the picture of Kleo, I thought of how beautiful she is. I didn’t say was I said is,” said Min. Farrakhan. Anthony Thomas attended the service, in part because his mother has been a church member for 25 years, though he is not an official member. 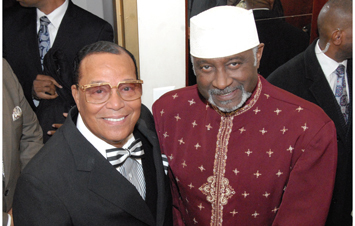 He says the unity displayed between Pastor Barrett and Minister Farrakhan is what is needed in the Black community. “With the guidance of him (Min. Farrakhan) and the universal teachings that he teaches, and that Pastor Barrett teaches as well, it’s a match made in heaven. That’s what we need. If upliftment is the main objective, this is what has to be done. Other churches have to have the courage to come and hear and listen to the Minister, listen to Pastor Barrett and come together and don’t be scared of White people and come together and do what we need to do,” said Mr. Thomas. Pastor Barrett was honored Min. Farrakhan was part of his 50-year celebration and compared the feeling to the classic 1947 movie, “It’s a Wonderful Life.” The ups, downs, ins and outs, of life all work together to make me what I am today, Pastor Barrett told The Final Call, after the conclusion of the service. You cannot develop mental or physical muscles without some burdens being on your mind and body, he explained when asked about his 50-year spiritual journey. “If what you’re involved in uplifts and betters people then that’s God’s purpose. So what if you get some knocks and bruises and some disappointments and whatever, it’s all working together for your good. I count this a wonderful life, 50 years and if I had it to do over again, I’d choose the same people. I wouldn’t choose White people. I wouldn’t choose some foreign people. I’d choose the same wonderful people who call me pastor, because they contributed to the essence of my being—which is to do God’s will,” he said. “That’s why they’re persecuting him—his righteousness. So, I count myself blessed to be one of his friends, to stand by him and not withdraw this invitation because he’s been in the news since Saviours’ Day,” explained Pastor Barrett.